Sears Carpet & Air Duct Cleaning is deeply committed to our franchisees. Our support begins from the first day of our association, and it includes virtually every aspect of sales development, marketing strategy, record keeping, computerized systems and operational management. Our goal is simple: to assure that every member of your team thoroughly understands how to acquire, service and retain customers for Sears Carpet & Air Duct Cleaning. Over time, a brand acquires powers far beyond a name. The Sears brand has come to represent quality, integrity, convenience and - most importantly - consumer confidence. As one of the most recognized brand names in the world, Sears has proven to be a strong and stable organization which has launched other internationally respected brands, including Kenmore, DieHard and Craftsman. When you decide to put the name Sears on your van, you're still the one in the driver's seat. So, what's in it for you? Our cleaning process was the first to earn the Gold Seal of Approval from the Carpet & Rug Institute for superior carpet cleaning. It means quality, well-maintained vehicles and UltraTech™ equipment designed and manufactured to our own unique specifications. It means providing our customers with products, service and advice that exceed their expectations. Every Sears Carpet & Air Duct Cleaning job is complete with the Sears world famous customer promise of Satisfaction Guaranteed. Our franchisees can offer much more than residential carpet, upholstery and air duct cleaning. They may offer tile & grout cleaning, water extraction, window cleaning, leather furniture care and commercial carpet cleaning to increase their sales. Going into business under the Sears banner means joining a nationwide team committed to upholding a time-honored tradition of quality, value and customer service. Sears has shown quite clearly for well over a century that an unflinching focus on customer satisfaction is the one true key to make a business a lasting success. If "Shop at Sears and Save" was the premise, "Shop at Sears and Be Sure" was the promise. 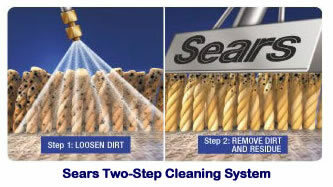 Become part of the Sears Carpet & Air Duct Cleaning franchise family and start your own tradition! Click on Request Information button above for FREE information on how to start a Sears Carpet & Air Duct Cleaning franchise today! Please Note: Sears Carpet & Air Duct Cleaning franchises for sale, and other franchise opportunities, business opportunities, businesses and franchises for sale on this web site are not to be considered as an "offering", "franchise offering", suggestion or recommendation by GlobalBX. The franchises, businesses and business brokers seen on this web site submit their own individual content. This advertisement depends entirely on the truthfulness of the information provided by our advertisers which includes, but is not limited to, franchisers, franchises, franchise brokers, franchise consultants, business sellers and business brokers. As always, GlobalBX recommends that you consult a lawyer, financial consultant, accountant or professional advisor before buying a franchise or business opportunity or any type of business. By submitting this form and requesting more information, you have agreed to all terms and policies of GlobalBX and the business and franchise offerings listed here. Please review our Terms & Conditions for more information.